← They’re back, they’re bigger AND there are still 10 of them! 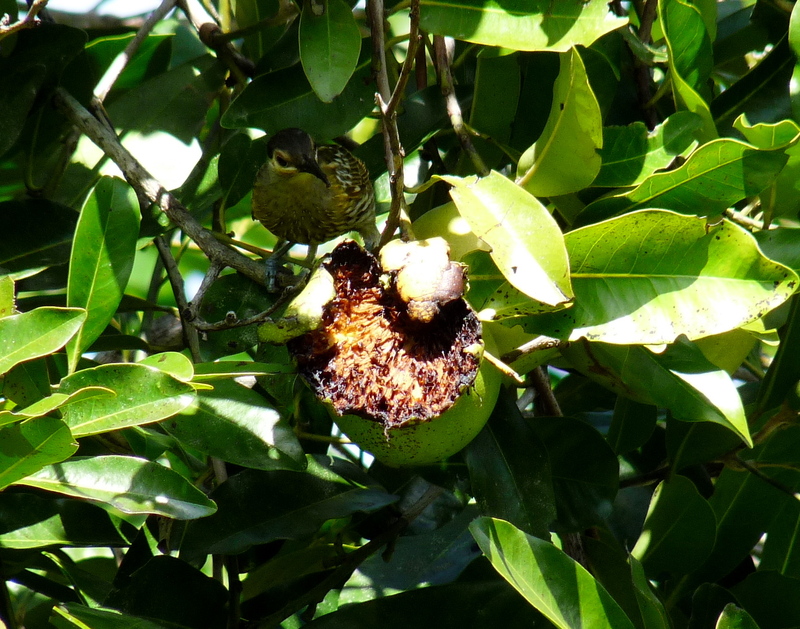 We grow Black Persimmon also known as Black Sapote (Diospyros digyana) in our tropical fruit orchard and although we do sell some of our crop there is always plenty to share with the birds. We pick the fruit when it is still hard but those left on the tree become beautifully soft and mushy – perfect tucker for Honeyeaters and Silver-eyes. 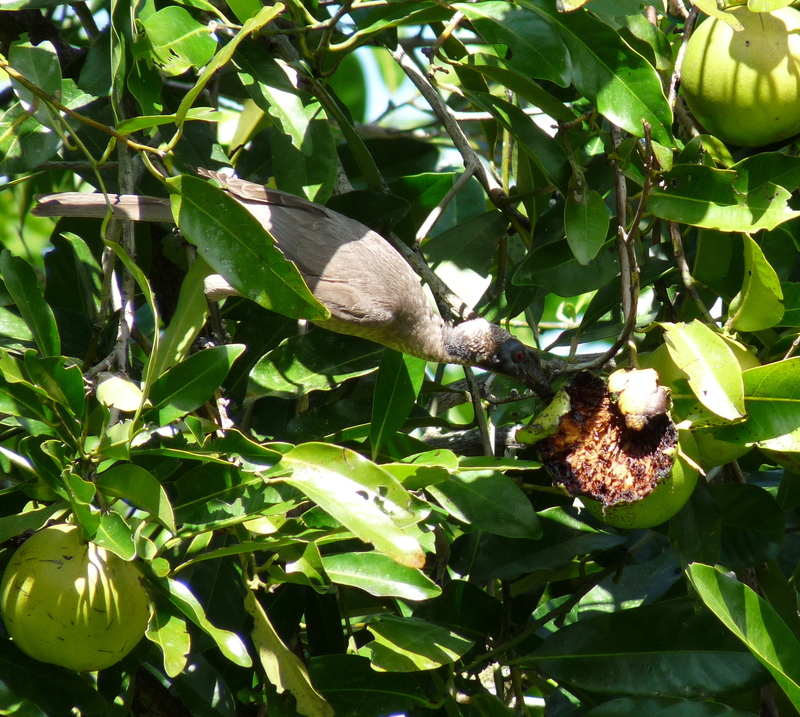 As there are not many fruit soft and ripe enough for the birds at the one time there is considerable competition amongst them with the Helmeted Friarbird eagerly pushing the smaller birds out. 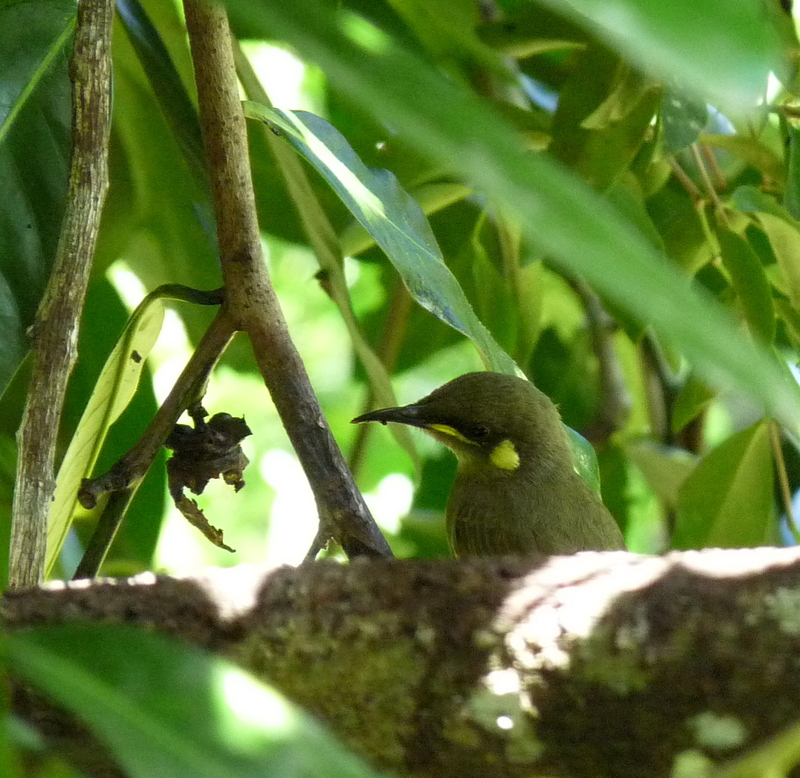 Macleay’s Honeyeater, an endemic species to our area, is cautious in its approach, waiting for an opportunity. Although it can be quite bossy around smaller birds it is dominated by the louder and bigger Helmeted Friarbird. At last, a chance to enjoy a sweet, nutritious feast. Black Persimmon is an excellent source of Vitamin C and also has good amounts of calcium and phosphorus. It is delicious mixed with yoghurt or made into a ‘smoothie’ but the birds seem happy to eat it unadulterated. Nothing left of this fruit as this Yellow-spotted Honeyeater (I’m not entirely confident about ID) has just discovered but they’ll be more. The crop extends over a couple of months so all the fruit lovers, ourselves included, will be well fed. 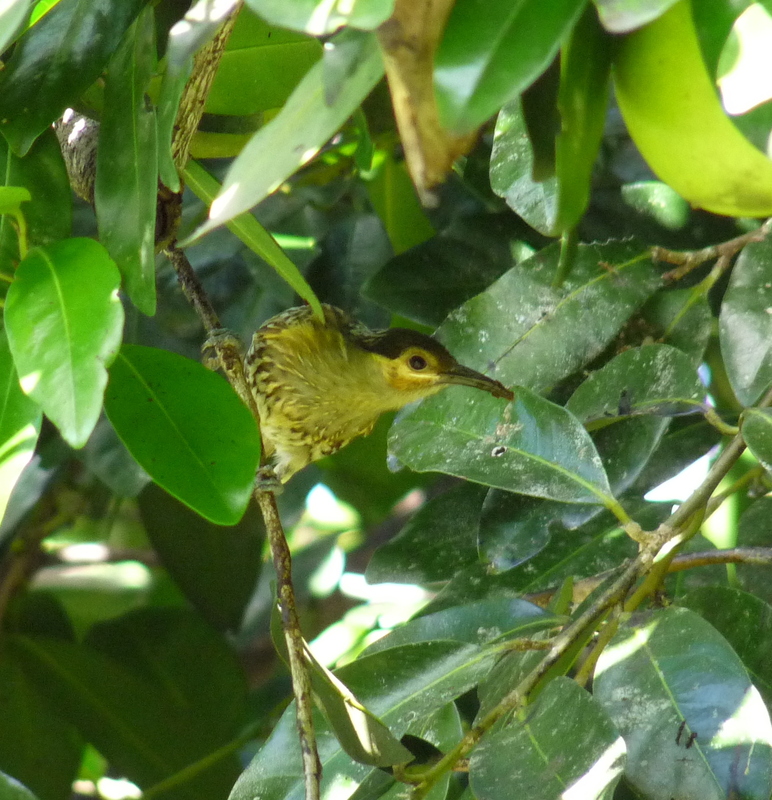 This entry was posted in Bird Observations, Exotic Fruit and tagged Black sapote, Helmeted Friarbird, Macleay's Honeyeater, Yellow-spotted Honeyeater. Bookmark the permalink. The birds are nice but the best part for me is having so much fruit that you don’t mind sharing it! Hi Mick, We’re happy to share so long as the birds remember as well! As the Black Persimmon are picked when the fruit is still hard and green we are able to harvest what we want without any trouble. Lovely story of sharing, as Mick says. The last Honeyeater looks very similar to the Lewin’s HE. Presumably a tropical off-shoot thereof. There are some native Persimmons. Is yours one of them? A local southern one, Diospyros australis only has fruit the size of an olive. Good for Bowerbirds, but not much appeal for humans. You’re right about the Y-S Honeyeater Denis; we occasionally see Lewin’s in the winter (seasonal migration from the Tablelands) so that increases the ID challenge even further. The Black Persimmon we grow in our orchard is native to Mexico. We do have native versions, Diospyros hebecarpa, D.compacta, D. sp. “Millaa Millaa” and D.cupulosa. Allen says the latter species is the only one with fruit worth eating – he has tried several species! Like other Persimmons the native fruits are best eaten when soft. Right on with ID, I’d say. Gape pointing to middle of ear patch points to Yellow-spotted. If gape points to base of patch, bird probably a Graceful (which also has distinctive one-note call). On fruit and honeyeaters, only Macleay’s and White-gapeds have shown interest in overripe bananas at pig traps in Tyto. And ripe guavas don’t attract many honeyeaters. Thanks Tony, I was hoping for some feedback from you. I remembered that you had some clues for telling Graceful and Y-S apart and I’m pleased I had it right. Re guava – Tube-nosed bats love them even if the Honeyeaters don’t!